The Welcome Page is a kind of portal within FinalBuilder, providing access to recent projects, news about current releases, tips of the day and other useful links. To show the Welcome Page, click the Welcome tab in the top left of the main window. • Getting started tutorial - opens a tutorial recommended for first-time users. • FinalBuilder Support Forums - takes you to the online support forums where you can get help from VSoft support staff and other users. The forums are opened in your default web browser. 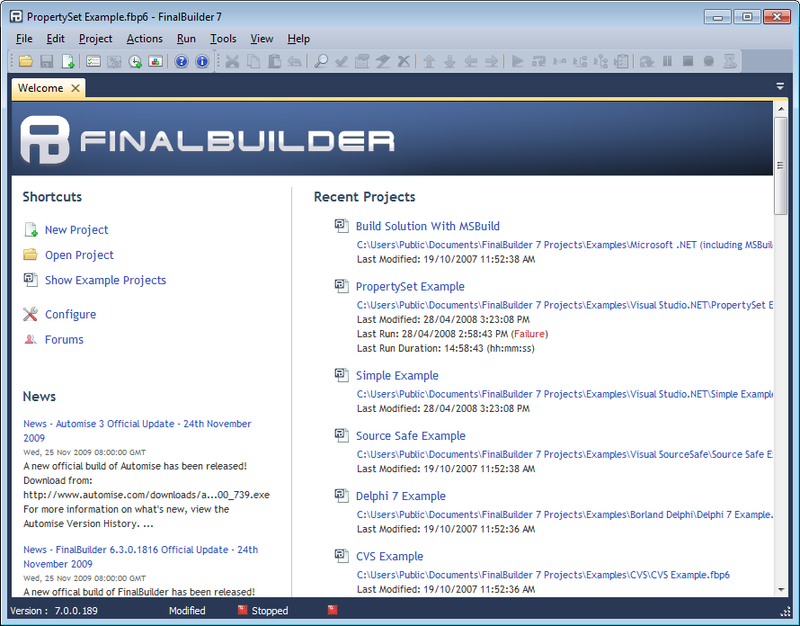 A new tip of the day loads automatically each time you open FinalBuilder. These links point to help on the most important concepts you need to know about. If you're new to FinalBuilder, we suggest having a read. The Newsfeed displays an RSS feed of recent events of interest. There are several feeds available, such as news, blogs, and latest articles. You can also choose any RSS feed you like, by clicking on the "Customise" link as well as disabling the newsfeed completely.